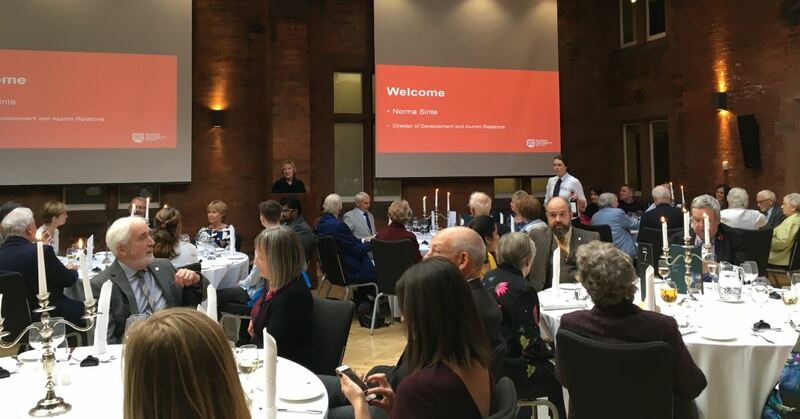 On Saturday 4 November Queen’s Acting President and Vice-Chancellor, Professor James McElnay welcomed the University’s top donors and supporters to Riddel Hall on Stranmillis Road, for the annual ‘thank-you’ lunch. Over 130 guests, one of the largest ever attendances at the event, enjoyed a lively drinks reception before taking their seats in the Isdell Courtyard. The occasion had been scheduled to take place in June but was postponed as a mark of respect following the sudden death of the University’s President and Vice-Chancellor, Professor Patrick Johnston. In his remarks Professor McElnay thanked those present for their support throughout the year and highlighted the impact philanthropy was having on the University. Guests later heard from Marlene Trimble, a third-year Psychology student from Kilkeel who, having moved out of the family home at 17, was enabled to come to Queen’s thanks to the University’s widening participation unit (WPU). Marlene acknowledged the support of the WPU, saying that without the help of several individuals in the Unit she would have been unable to pursue her academic dreams. Now a WPU and NSPCC counselling volunteer, Marlene hopes to return to Queen’s after she graduates to study for her Master’s. In recent months Queen’s has launched its Pathway Opportunity Programme as part of its widening participation initiative, which will see successful Pathway students coming to the University next September each receiving a £1,000 bursary to help then with their studies and other needs. To view the short video highlighting University achievements in the last year please click here. And please visit the Development and Alumni Relations Office website to find out how you can support the fundraising work of Queen’s Foundation.